I didn’t actually believe my friends when they told me that I’m going to be in for a world of pain if I choose to use laminated wood in almost every room. I don’t live in a palace or anything, but the few rooms that I have are pretty hard to clean all by myself, especially with my obsession for everything to be spotless. There are plenty of cleaning products in my local store and I’m sure that you can think of a couple of brands right now, but so far I haven’t found the perfect one. Not only the results are not what I expect them to be, but I don’t really like the way they smell, not to mention my reluctance to use products rich in chemicals. All these concerns and frustrations led me to something positive after all, because my research led me to this amazing homemade floor all purpose cleaner. It is something that sounds too good to be true and I assume that it is the exception to the rule, because it actually exceeds expectations. Add all ingredients to spray bottle and shake to combine. Spray cleaner on the floor. Wipe up with a microfiber cloth. There is no high price tag associated to it and you don’t need to be a chemist to create it, because the ingredients can be purchased from any store and combined in a couple of minutes. 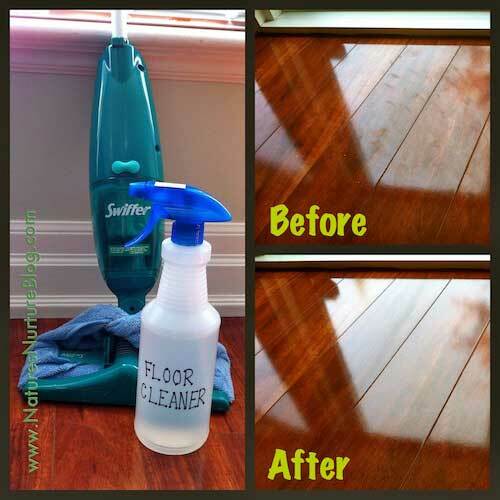 What began as an experiment for cleaning the floors turned into a cleaning frenzy with an all-round mixture that can remove even the most persistent stains from glass, steel or tile floor.